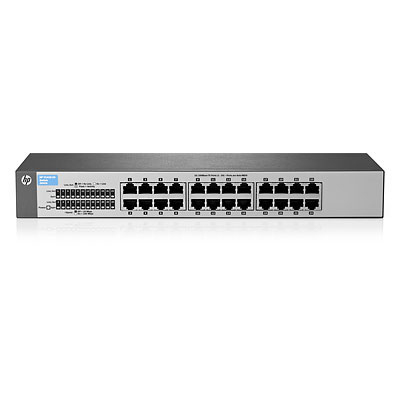 HP 1410 Switch Series comprises unmanaged Gigabit Ethernet and Fast Ethernet switches designed for small businesses looking for entry-level, low-cost networking solutions that come with a lifetime warranty. The series consists of nine models with flexible mounting options to meet different network switching needs. All models have quality of service(QoS) support and IEEE 802.3x flow control features that provide outstanding data efficiency. Simplified plug-and-play convenience is enabled by features such as Auto-MDIX and auto-speed negotiation. HP has innovated and combined the latest advances in silicon technology to bring you some of the most power-efficient switches: 1410-24G-R,1410-16 and 1410-24 models are advanced IEEE 802.3az-compliant unmanaged Gigabit and Fast Ethernet switches. The switches come with built-in green features and a lifetime warranty, making the series the right choice for organizations seeking a networking solution that's both economical and reliable.